November 11, 2014 – Hartnell College Planetarium is offering a new free show, “New Horizons for a Little Planet”, to all full dome planetariums. “New Horizons for a Little Planet” is a lighthearted introduction to NASA’s New Horizons mission to Pluto and the Kuiper Belt. Launched in 2006, the New Horizons spacecraft is scheduled to fly by Pluto and its moons in July of 2015. The purpose of the program is to introduce planetarium visitors to the mission prior to its arrival at Pluto. After it encounters Pluto, New Horizons will continue on through the Kuiper Belt and the mission will likely be extended. A smaller, more primitive Kuiper Belt Object will then be targeted for a rendezvous in 2018 or 2019. These encounters promise us unprecedented close up views of these distant worlds and the information gathered by New Horizons will provide valuable insight into the formation of our solar system and its planets. Alan Stern, of the Southwest Research Institute (SwRI) in Boulder, is the principal investigator and leads the mission. The show comes with a Resource Package which include animations, artist renderings, education material, info and handouts. 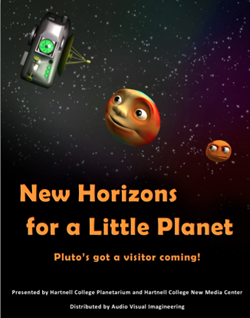 If you are interested in presenting “New Horizons for a Little Planet” simply fill out the New Horizons Download Application below. Once accepted, AVI will provide you with links to download your Dome Master and Resources. No license agreement is required. To apply for a free copy of the movie, visit: http://www.av-imagineering.com/new-horizons/. To watch the movie online, visit: http://vimeo.com/110888503?width=500&height=500.